Since release, Call of Duty: WWII has received a brand-new event every month or so from developer Sledgehammer Games. Usually the new mode gets teased in advance, but this time it was dropped with no warning. 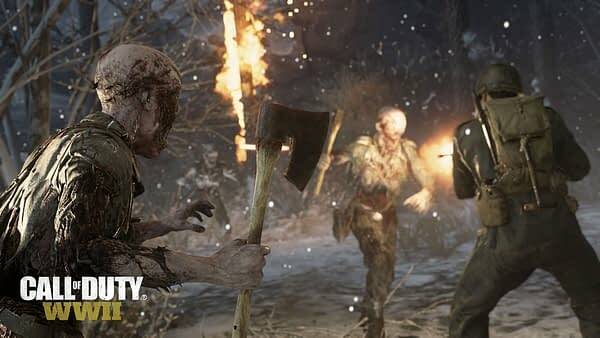 Sledgehammer Games and publisher Activision announced the Attack of the Undead in-game event as it went live. In terms of content, the event adds seven new weapons, including the Nambu Type 2 submachine gun, the Stinger light machine gun, the Lever Action and PTRS-41 sniper rifles, as well as the Fire Ax and Sword (which is strangely called the Claymore) melee weapons. In addition, the event also brings three new game modes to WWII, which includes Infected, Hordepoint (a variation on Hardpoint), and Relic of the Undead. The event also adds a brand new map called Groesten Haus to Nazi Zombies. As expected of an event named Attack of the Undead, you should expect a whole lot of zombies in game, even when you aren’t playing the Zombies mode. Because this is a video game announcement, it was naturally accompanied by a trailer which you can check out below. Call of Duty: WWII was released last year and is available on PlayStation 4, Xbox One, and Windows PC.